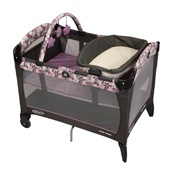 with Bassinet & Toy Bar with Foldaway Wheels. T The New Phil & Teds Peanut Bassniet in black is a great addition for any of our Phil and Teds Buggy Strollers. 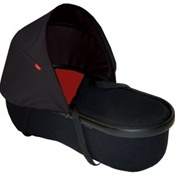 The New Phil & Teds Peanut Bassniet in red is a great addition for any of our Phil and Teds Buggy Strollers. 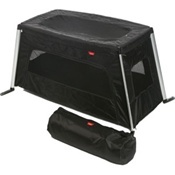 The Combi Tatami Play Yard in Jade can be Setup or fold in as fast as 5 seconds! 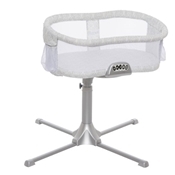 The JPMA Approved Tina Portable 3 in 1 Folding Portable Crib. 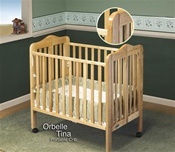 The Orbelle Light Weight Portable Crib comes complete with it's own Mattress. Beautiful White Wood, with a 3-Position Mattress Support. Folds Flat for Easy Storage. The JPMA Approved Tina Portable 3 in 1 Folding Portable Crib. 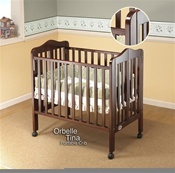 The Orbelle Light Weight Portable Crib comes complete with it's own Mattress. Beautiful Cherry Wood, with a 3-Position Mattress Support. Folds Flat for Easy Storage. 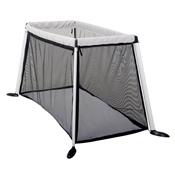 The JPMA Approved Tina Portable 3 in 1 Folding Portable Crib. 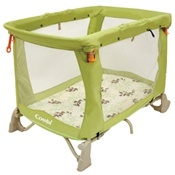 The Orbelle Light Weight Portable Crib comes complete with it's own Mattress. Beautiful Natural Wood, with a 3-Position Mattress Support. Folds Flat for Easy Storage. 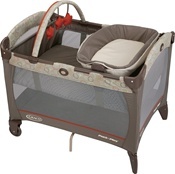 The Graco Pack n Play Silhouette Playard Edgemont provides a great retreat for rest or play and has soft, contoured lines and a cozy, oval quilted bassinet that create a premium environment for baby. 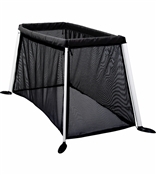 The Phil & Teds Traveller in Black is a full size cot/crib that weighs less than the baby! 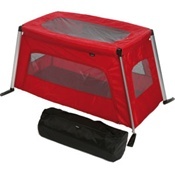 The Phil & Teds Traveller in Red is a full size cot/crib that weighs less than the baby! *Mom's Choice Awards Recipient! * The much requested Snuggle Me Organic Pure. **NOW 2 INCHES LONGER! ** Organic cotton fabrics and hand-filled with raw organic cotton. The Snuggle Me is designed to fit baby's torso, perfectly recreating the feeling of resting in a set of arms, helping with common infant sleep issues like frequent waking, startling awake or wanting to sleep in a parent's arms or chest. A CRADLED & SECURE COSLEEPING SPACE: In the Snuggle Me, your baby receives the sensation of a hug as the cushion's sides gently pull in against them. A SUPPORTIVE & EXCLUSIVE DESIGN: The feeling of touch is created by our patented Center-Sling Technology, which no other product is able to capture. It is not just a place to lay baby, but a weight-activated sensory pillow proven to help baby sleep in longer, more solid spurts. Reinventing the womb and giving baby a gentle snuggle is what we have done for over 9 years. Others have imitated, but nothing comes close to a Snuggle Me. ORGANIC & ECO-FRIENDLY: Essential for co-sleeping parents and eco-conscious families, wanting the highest quality, organic, non-toxic, sleep and play environment for your baby. 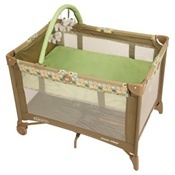 Use as a cosleeping bed, bassinet mattress, travel bed, or as a lounger or tummy time helper. The perfect postpartum aid for mama. WOMAN OWNED BUSINESS & USA MADE: Made with USA-grown, certified organic cotton fabrics and hand-filled with raw, untreated organic cotton. Designed for babies 0-9 months. 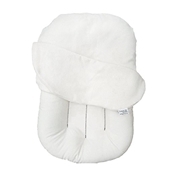 Comes with a Snuggle Me Organic cushion, removable (washable) organic fleece cover and is packaged in our muslin travel bag. No flame retardants added. 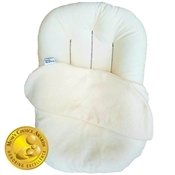 WINNER of the Prestigious MOM'S CHOICE AWARDS - The Snuggle Me PURE is made with 100% organic cotton for the material with 100% raw organic cotton for the fill. Handcrafted, hand sewn, hand filled, it is the best choice for parents who want an affordable, durable, and healthy sleep space for their babies. The Snuggle Me Pure is an infant lounging and co-sleeping bed uses its patented center-sling technology to snuggle your baby so that not only are they cuddled as though they're being held, but they're also kept in the safer supine position for sleep (back-to-sleep) The organic cotton materials we use creates a safe, non-toxic sleep (and play) space for your baby anywhere in the house. Essential for eco-conscious parents. In addition to the almost magical qualities we've mentioned above, **All of our baby items are free from: LEAD, FLAME RETARDANTS, LATEX, PHTHALATES, & BPA's. **All organic components used to create your Snuggle Me Organic are: THIRD PARTY CERTIFIED ORGANIC, ETHICALLY SOURCED, LOCAL, MADE IN THE USA, CHEMICAL FREE. **All of our materials are: BREATHABLE & ONLY THE BEST QUALITY FOR YOUR BABY.